This vapor barrier actually measures 20 mil at the plastic, not the thread. The top of the 20 Mil SilverBack™ is a brilliant white. This clean white color helps to reflect light in the crawl space and give it a pleasant appearance. The top layer is made from 100% virgin polyethylene resin to give the absolute best performance and last a lifetime. The middle of the 20 Mil SilverBack™ houses the polyester thread reinforcement. This reinforcement has one job and that is to eliminate tearing. The grade of polyester cord is the same that is used in tires to keep the rubber stable at highway speeds. 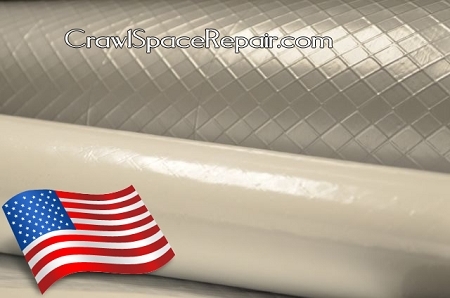 The reinforcement is permanently embedded in the vapor barrier with an additional layer of molten polyethylene. This insures the 20 Mil SilverBack will never delaminate. 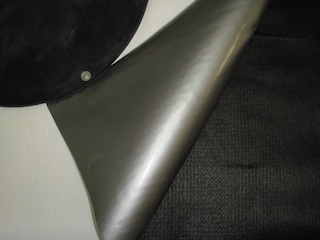 The back of this product is a silver color, which is the trademark of the SilverBack™ brand. Color additives do add cost to the product, but we view this cost as necessary to help homeowners and contractors know they are buying a genuine quality product. The back layer does not have pinholes or fillers and naturally resists mold and mildew. 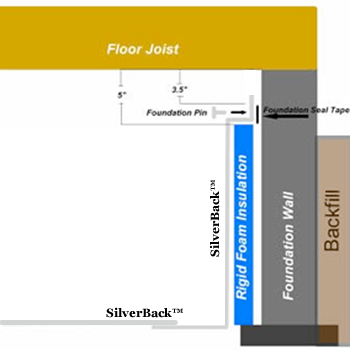 20 Mil SilverBack™ is thick enough and strong enough to allow for medium to heavy storage, heavily traveled areas and to cover stone/concrete floors. We still recommend the use of the Felt550™ if the floor has objects that are sharp and can not be removed. The actual 20 Mil thickness of the 20 Mil SilverBack™is one of its strongest features. We measure actual thickness at the plastic, not the reinforcement thread like others do. See the video below to see how it is measured and compared to the competition. The SilverBack™ 20 Mil vapor barrier weighs 109 pounds per 1000 square feet or 109 MSF. Compare that to the competitors 20 Mil @ 74 pounds per 1000 square feet. That's 35 pounds less plastic for the same money as the SilverBack™. Use the 20 Mil SilverBack™ on the floor and the 12 Mil SilverBack™ on the walls to keep the costs inside the budget. Click here for information and a video on how to install this product. Supply photographs within 90 days of purchase showing the 20 Mil SilverBack vapor barrier was installed within that 90 days and receive a free 10 year replacement warranty against delamination. The SilverBack Vapor Barrier was a great product, very durable and thick. Tim from the office was very helpful throughout the whole installation process. I cannot recommend this product enough. We installed it in our crawl space after the Colorado floods in 2013. 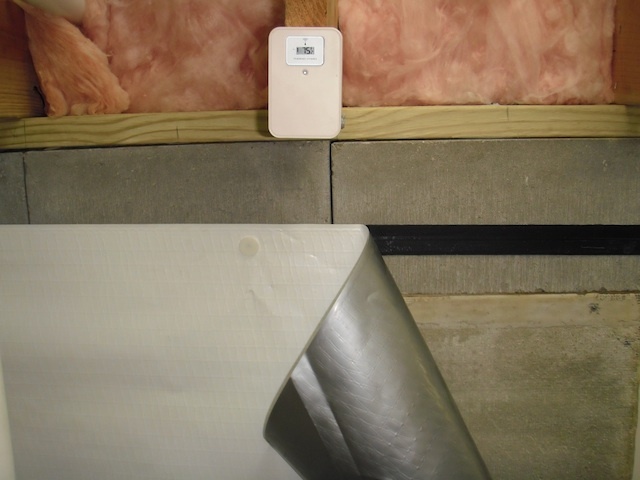 After installing it, our crawl space has been warm and dry and we have had no mold issues. I was hesitant to use the foundation pins, but the person we talked to said we really needed them, and he was right. We were able to rent a pin gun from our local hardware store and the combo of the pins plus the caulking has held up extremely well. In this day and age of bad customer service and poor quality products that look good but don't deliver, it is nice to find a product that does what it says it will and exceeds your expectations. Highly recommend. I absolutely love the vapor barrier plastic. I have done a lot of research about vapor barrier plastics before I made my purchase and your product is everything you advertised. The 20 Mil SilverBackÃ´ is the strongest plastic, even the handyman that I hired to install it said it was the best quality he had ever installed. He asked me for your address and said he would recommend this product to all his clients. Also, my order was filled very quickly and arrived in just a few days after I placed my order. Thank you! Great product and service! Very happy with product and support. With rock hard chunks of clay and sharp pieces of concrete debris all around, anything less then 20mil would have been a disaster. If I had to do this job again, I would have gotten 2 six foot wide rolls rather then the 13 foot wide roll. The 13 foot width was very difficult for my brother and me to manage when your on your knees and belly. I purchased the 20 Mil liner for my new construction crawl space and had it installed and then sealed to the walls by a reputable spray foam company. They and I are were impressed with the product. The crawl space has extremely low humidity since installation. The liner seems very durable. I am happy with the choice. Wow, how happy am I that I purchased this product. Our basement now smells good, dry, and clean. Love how the white makes everything look clean. Easy to work with. Feels even better over felt liner. Cleans up well. I wanted to install a high quality liner in my crawlspace that would not need to be replaced for many many years, if ever. The Silverback 20 mil liner was the perfect fit. When I had a couple installation questions the customer service was excellent. If you want a high quality product to protect your crawlspace I highly recommend this product. This plastic is the highest of quality . I used the twenty mil with felt and it has made a world of difference. I highly recommend this product and company. Products are fantastic and easy to use. My crawl space looks fantastic and clean. All the moisture from the Colorado flood that made its way upstairs is all calming down. My son and I installed the 20MIL Silver Back vapor barrier in our 11x22 dirt floor crawlspace. The product is excellent and I couldn't be happier. The 20MIL liner is nice and thick and tough, so Rubbermaid tubs and boxes we store in the crawlspace scoot cross the liner with no problems and no chance of tearing the liner. I couldn't believe how fast it came! I ordered it online, the next day it was here! Would highly recommend it to anyone considering lining their crawlspace. I installed this 20 mil SilverBack in a 24x26 crawl space. The results were great. You can't go wrong with this product. I expect it to last for many years. Buy it. I used the 20 Mil and 12 Mil SilverBackÃ´ crawl space vapor barrier this weekend and the product is fantastic, easy to use, and arrived incredibly fast and undamaged. The Waterproof Seam Tape was also something I was glad I purchased. Thanks for making a great product! The 20 mil vapor barrier was great, easy to work with and my customer was well pleased. I will use again because it exceeded my expectations in every way. After spending 3 years researching for a quality crawl space vapor barrier for my cabin - I went with your 20 mil vapor barrier. The sales staff were very helpful, reviewing the products required, and giving installation advice. The installation went great and I could not be more pleased with the products. Bright white, no off gassing, no more musty smell from the crawl space. The product exceeded my expectations (and that almost never happens for me). Our contractor has completed installation of the vapor barrier in our crawl space.....he was very satisfied with the components we purchased from you. Your membrane was clearly superior to materials available locally. Well, I bought it twice in a row. What does that tell ya? Good stuff. Good performance. The Silverback vapor barrier seems to be very durable and easy to work with. I did a lot of leveling of the gravel in my crawlspace which made everything relatively square. I can see how an irregular surface may lead to a more difficult installation. The materials were of high quality and worked as advertised. I used the 20 mil SilverBack over 5100 felt. Got a quote from a company to install this system for me for $6,700! I went to Crawl Space Concepts after researching several vapor barrier products and ordered everything I needed for $1,200 including shipping. Installed the entire system in my crawl space in 2 days. The products were all exactly as described, high quality, easy to use, and relatively inexpensive. I am VERY pleased with the final results and thanks to Crawl Space Concepts, I saved $5,500!! I am glade I was able to find you on line. This is an extremely heavy duty product. I got it to put on some particularly heavy traffic sections of my crawlspace floor; elsewhere (floor and walls) the 12-mil product is more than adequate. The only two to consider are the 12-mil and 20-mil DrySpace. Definitely recommend the product! Solved the house odor issues immediately. Worth every penny. The sketches provided by Larry were exactly what we needed to do the job right the first time without any redos. Very happy with the product! Like working with this products. This is a great creation and is a very high quality material. I am very pleased to have used this product. It worked wonderful. Everything I purchased was as described and worked as described. I used this product on my walls and am very pleased with the product. I referred this product to friends.